The US Government recently issued a series of court orders aimed at technology companies that may have information concerning individuals affiliated with Wikileaks, the web organization that publishes classified information, such as the numerous cables from US ambassadors that’s caused such a stir. Microblogging social network Twitter was among the companies that were ordered to turn over information. Previous procedure for this type of activity would mean that Twitter would issue a communication to those users prior to handing over information to authorities. However, this court order had a specific gag order preventing them from doing this. Twitter decided to challenge the order instead of blindly opening up their database. Regardless of where you stand on Wikileak’s decision to publish hundreds of previously classified US Cables, Twitter stuck up for its users and refused to bend to the whim of authority without just cause. 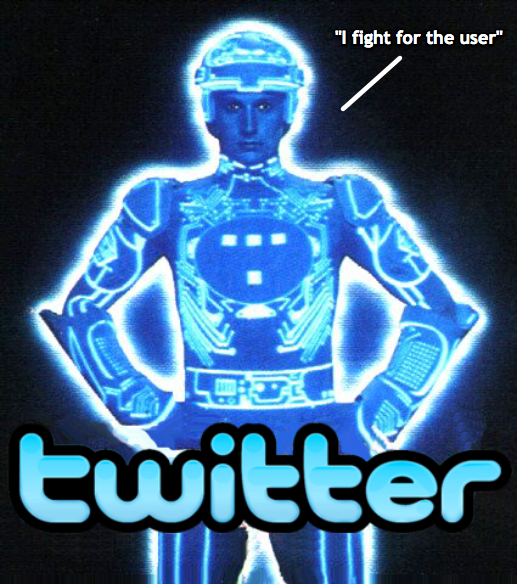 And while Wired staff writer Ryan Singel joked that Twitter’s latest feature was “growing a spine”, I was far more inclined to draw similarities to Tron. Why? Because he fights for the users. If Disney was smart, they’d start licensing off this property to large tech companies that want to tout their privacy policies and such.